The Good Design Awards, established by the Japan Institute of Design Promotion (JDP), recognize designs that positively impact lifestyle, industry and society in general. The awards showcase designs that are both effective in form and function. Toyota’s Automated Guided Container Transport System was selected from a pool of 3,000 global entries and honored for its new design that fuses hardware and software elements. According to one judge’s comment, "The Automated Guided Container Transport System is a perfect example of fusing the design of a physical object with the design of a social system (structure)." As an award finalist, Toyota’s design is a candidate for the "Gold" Award which will be announced on November 25. 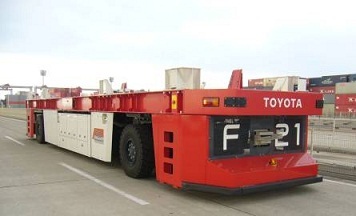 Toyota’s new product automates transport work in storage yards and leverages the software technology to help synchronize and optimize overall loading and unloading operations. The AGV deployment system enables efficient dispatch of AGVs in conjunction with other cargo-handling equipment such as gantry cranes in operation at the container yard. The end result is increased productivity through a reduction of idle time of cranes and container trailers. Full-scale automated operations were first implemented in early 2012 by the Tobishima Container Berth Co., Ltd. at the Port of Nagoya, Asia’s only automated terminal.